Tyson Fury has been summoned by the British Boxing Board of Control to explain his recent controversial comments. World heavyweight champion Fury, 27, who expressed views on women, abortion and homosexuality, has been asked to attend a meeting in the new year. The BBBofC met to discuss the matter on Wednesday before informing Fury that he must meet with the board. The Briton has denied he is a homophobe and claimed he is "uniting the world". No exact date has been confirmed for the meeting. Meanwhile, Fury will not face police action following an inquiry into alleged homophobic comments. Greater Manchester Police (GMP) received a complaint earlier this week after statements made on the BBC's Victoria Derbyshire programme. But the force has recorded the comments as a "hate incident" as opposed to a hate crime. 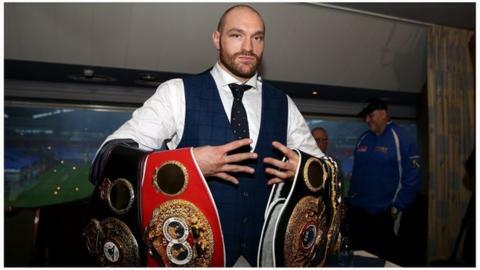 In the aftermath of his win against Ukrainian Wladimir Klitschko in Dusseldorf, Fury had said: "I'm not sexist. I believe a woman's best place is in the kitchen and on her back. That's my personal belief. Making me a good cup of tea, that's what I believe." The new world champion has also previously said it would only take the legalisation of paedophilia in addition to the decriminalisation of homosexuality and abortion to see "the devil come home". The Manchester fighter subsequently said: "Tyson Fury loves his fellow humans. He doesn't hate anybody." Fellow BBC Sports Personality of the Year nominee and long jump champion Greg Rutherford had planned to withdraw from this year's event over Fury's comments, before reversing his decision. Fury, who won the WBA, IBF and WBO titles on 28 November by beating Klitschko, was stripped of the IBF belt on Tuesday after choosing to face Klitschko in a rematch instead of the IBF's mandatory challenger, Ukrainian Vyacheslav Glazkov.